What are Kids Club Events? Come out on the second Saturday of each month for a free, fun-filled event for kids of all ages. Kids Club Events are hosted by a different group every month. Each month may feature shows, crafts, interactive activities and more! 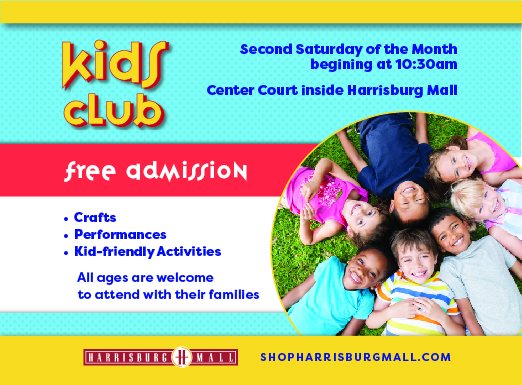 Please arrive at 10:30am for Kids Club activity. Free admission. Located in Center Court (center of the mall, first floor). Join 2nd & Charles on Saturday, May 11 from 10:30am-12:30pm. Wake up from your springtime daydreams and join in for some fun! Singing! Dancing! Storytelling! Games! Arts and Crafts! You will be able to create your own paper pinwheel, paper airplane, crown, and so much more!